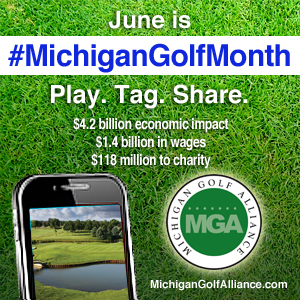 “Let’s do lunch at the turn Michigan Legislators!” The Michigan golf industry will share its message with each state legislator on Thursday, June 6, by presenting the popular Michigan Golf Day at the Capital event. As a member of the MGCA you are invited and encouraged to attend. The Michigan Golf Course Association, the Michigan Golf Course Superintendents Association, the Michigan Section PGA, the Golf Association of Michigan, the Greater Michigan Club Managers Associations and the Michigan Turfgrass Foundation, which form the Michigan Golf Alliance, will convene on the lawn of the state Capitol and visit with each legislator. For over a decade golf course owners, operators and superintendents have gathered each spring to voice a cooperative message. This year the leaders of Michigan golf have created a dynamic day of activity to promote the game and the golf business. The Michigan Golf Alliance has put together a great program to facilitate golf industry representatives in introducing themselves and informing the Legislators and their staff on who we are and what our industry brings to the State of Michigan. We can't overstate the importance of this day in delivering the message to our government leaders. The schedule will include Senate and House office visits and “lunch on the turn” provided for all participants. Legislators will be invited to lunch with their constituents.